Yes! Finally got a snap of the elusive peahen I've read so much about. Heard it used to live on Pagoda Pl. and now lives all over the hill. Some people hate it, some people love it. How can you not love such a cool beautiful creature? The J.B's "Pass the Peas"
Hate it because it lifts up the sod, stinks up the backyard with its guano, and sounds like a prowler when it hauls its 60+ pound self across the roof and into the jacaranda at night. really neat blog, i'm glad i've found it. I am fascinated with the history of LA and there's something about northeast LA that always has my curiosity. The charm of this historic suburban area of Los Angeles is irresistable to me, and I'm glad to have found a blog so well-written by someone who appears to live in the neighborhood and know it well. Great photos. 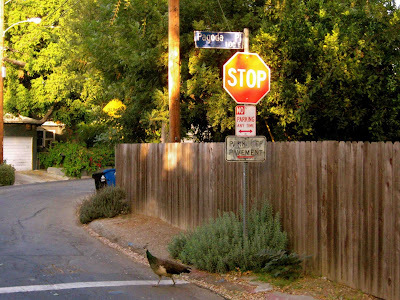 And the first time I've ever heard of a neighborhood peahen! I prefer the noise of pea hens to the crow of rosters that certain members on my street thought would pass unnoticed. Love her! SO glad she's ok - haven't seen her around our part of the hill since April. She eats the bugs out of our yard, and she's wonderful to watch. I'm glad to see her too- she used to come by but it's been months. It's always somehow magical when I awake to her outside my window. She's law abiding too -- uses the crosswalk.